Nobody has to tell you how competitive online marketing is. I’m sure you already know. You need every edge you can get. And while I definitely do not endorse evil tactics (negative SEO, stealing content, and all the other unbelievably nefarious stuff that goes on), I don’t recommend you ignore your competitors, either. You need to do at least some competitive analysis. It’s critical to know what your competitors are doing, if only to use the information as another way to gauge what your audience likes or dislikes. To help you assess your competitors (but not get buried in the analysis), we’ve rounded up a list of tools to help you see your competitor’s strengths and weaknesses. All of these tools are either free or have free trials. To take things a step further than just the usual list of competitive tools, I’ve also included some ideas on what you want to know about your competitors, why you want that information, and how to use it. Tools are awesome, but if just knowing all the tools was enough, you’d already be rich. “Swot’s that?” You ask. SWOT stands for strength, weaknesses, opportunities and threats. If you had gone to school to get an expensive marketing degree, this is one of the things they would have drilled into your head. As you can see, you don’t have to write a whole page for each area. SWOTs can be done on the back of a napkin. The trick to them is to put yourself in your competitor’s perspective while you do the SWOT – look at their business like it was your business. 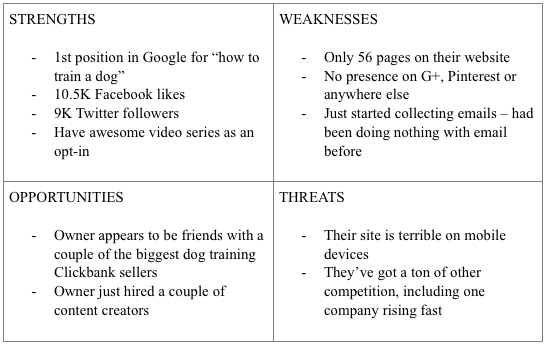 You don’t need to do a SWOT for the top 20 sites in your niche. Just do a quick, simple SWOT for your top 1-5 competitors. This alone will give you a snapshot of where you stand against them, and how you might leverage your existing business to gain an edge on them. That’s the only pen and paper “tool” I’ll give you. All the rest are online. The first thing to do when you size up a competitor is to look at their website. You want to know what content they have, how it’s performing, and how they are monetizing that content. Start with the content on their site, then see where they might also have more content, like social media accounts, guest blog posts, Amazon Kindle books, Udemy courses and the like. Next you’ll want to see how much exposure that content is getting, both through search engines and through inbound links, advertising, partnerships and social media. It helps if you take notes while you’re doing your research. It helps even more if you make a spreadsheet to log all the data in one view. Think of the spreadsheet a bit like a map to your niche. Having a resource like this also means you can easily track how your competitors shift tactics over time. That alone can be worth doing the research. Product? Subject/ Title? Product Price? How good is the product? 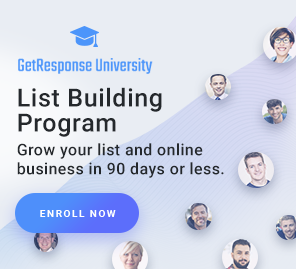 Email list? What’s their opt-in? More than one opt-in? Blog? How often updated? How long are posts? How good are posts? Which posts shared the most? Which posts commented the most? Ebook? Kindle, or site download? Who follows them on social? Who shares their content? You may not want to go into this much detail, but consider this: How much time are you going to put into building a business in this niche? 10 hours? 100 hours? 1,000 hours? How much time could you save and how much more results could you get if you knew the business and your competition before you went in? This is so simple it doesn’t even count as a tool, but signing up for someone’s email list and following them on social media are the single best way to keep track of what they’re up to. Google Alerts and Social Mention. These won’t catch 100% of what’s on the web, but they will catch most of it. Set up your competitors’ business names and the owners’ names to see what people are up to. 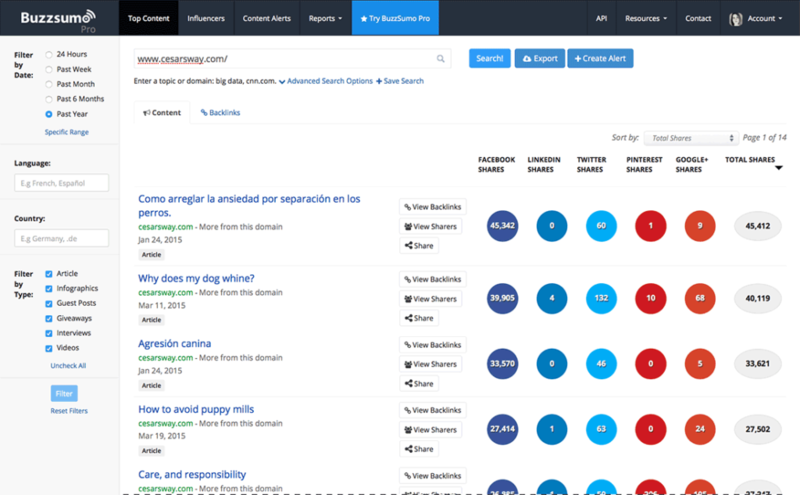 BuzzSumo – This will show you which content on a site has gotten the most shares. It will also show you who’s been sharing the content. You can sort by time frame (last month, last six months) and by the type of content. It’s an ideal way to find out what your competitor’s greatest hits have been. SharedCount is a similar tool, but with fewer features. 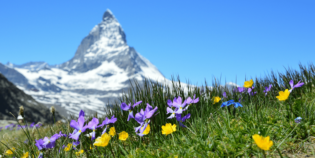 Kapost’s Content Auditor – This was not built as a competitive analysis tool, but it works very well as one. 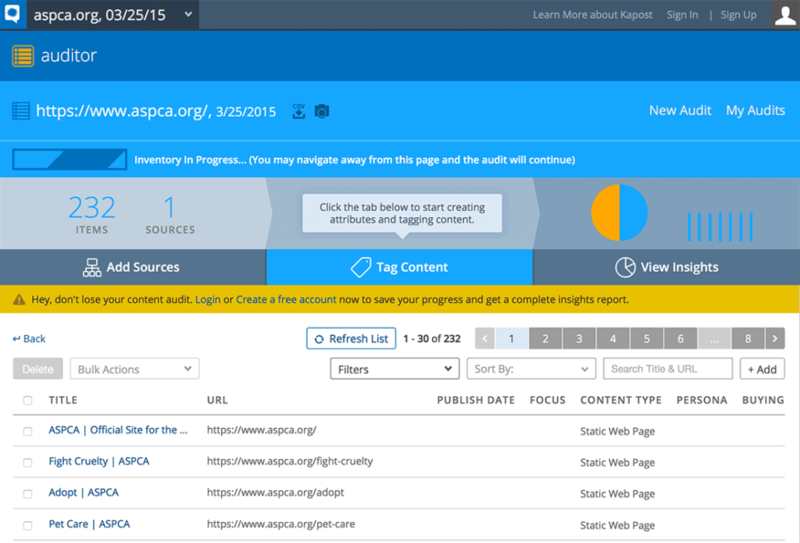 The Content Auditor basically gives you an automatic content audit of any site. So if you want to see what content assets your competitors have, and how they’re performing, this will show it to you. If you want even more detail, you can also use the free version of the Screaming Frog SEO Spider tool. WooRank – WooRank is mostly an SEO tool that scores a site and gives recommendations on how to improve its SEO. If you run a competitor’s site through the tool, you’ll get detailed information on all their SEO sins. Quick Sprout – This free tool lets you compare up to four different sites at once. 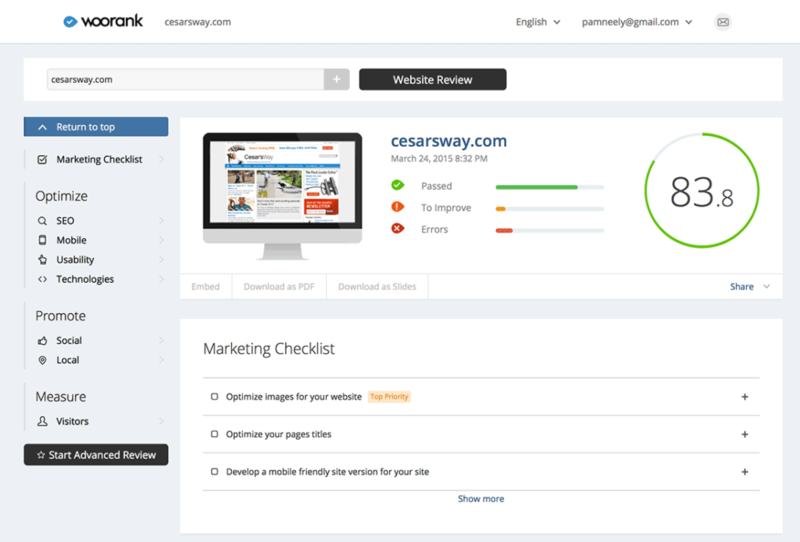 Like WooRank, it’s designed as an SEO tool, but is also designed as an SEO tool for competitive analysis. 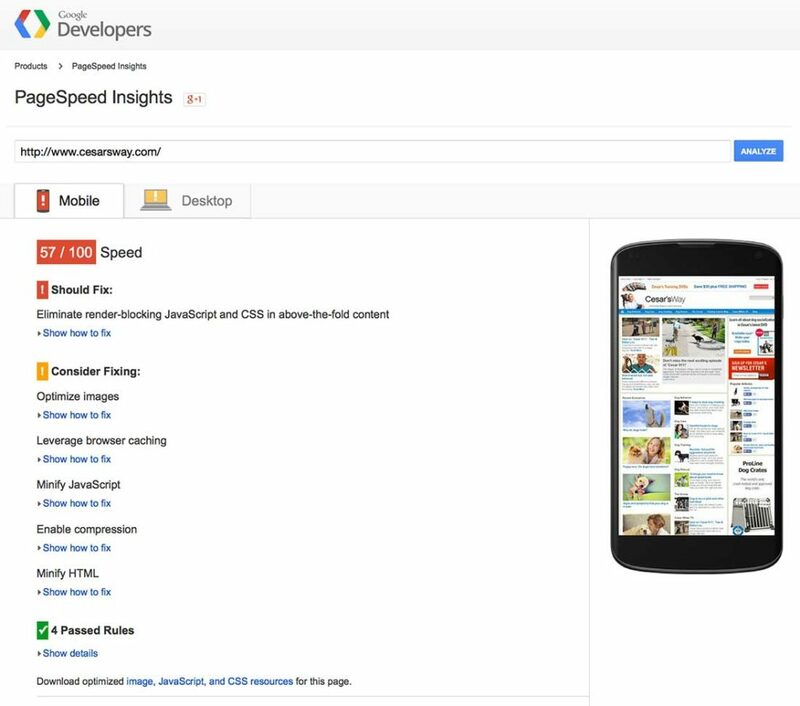 Use Google’s PageSpeed Insights – Page speed has a huge effect on user experience, conversion rates and SEO rankings. 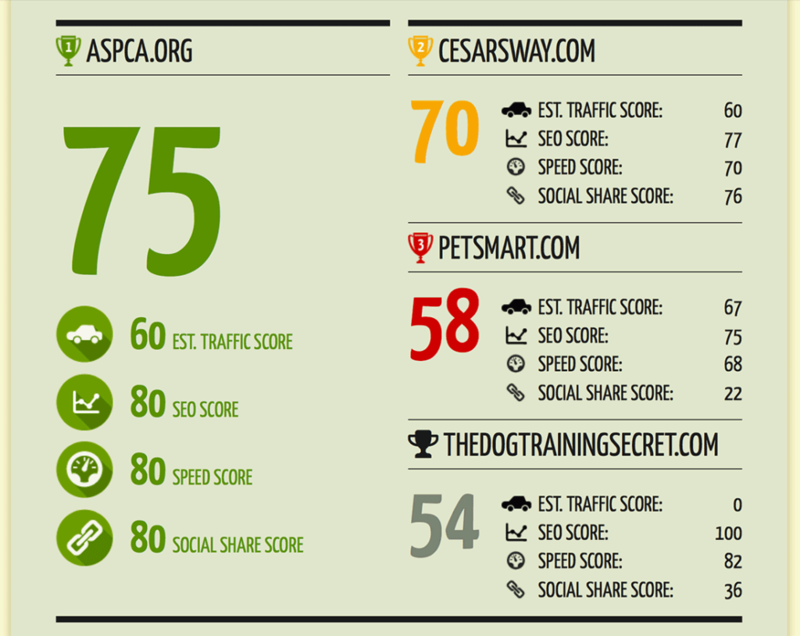 Use Google’s official tool to see if your competitors are fast enough. 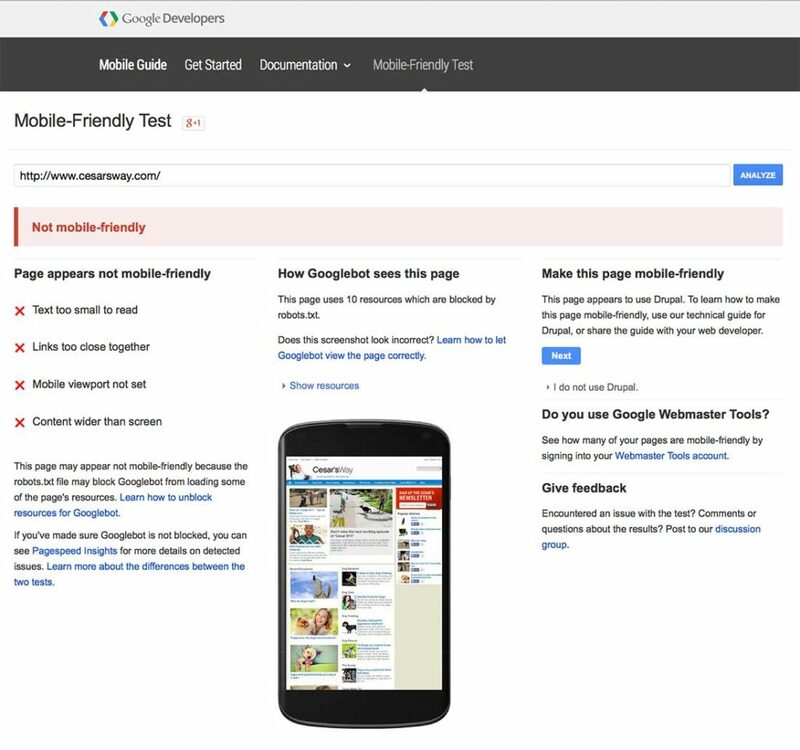 Google’s Mobile-Friendly Test – Google is going to update its algorithm on April 21st to favor mobile-friendly sites and punish those that aren’t. If a few of your competitors have negative mobile-friendly scores, you might be in for a pleasant surprise in late April. That’s assuming, of course, your site is mobile-friendly. It is, right? There are so many tools that help you find (or “poach”) your competitor’s backlinks. Start with Majestic SEO because it’s free, trusted and will get you 98% of the information you need. 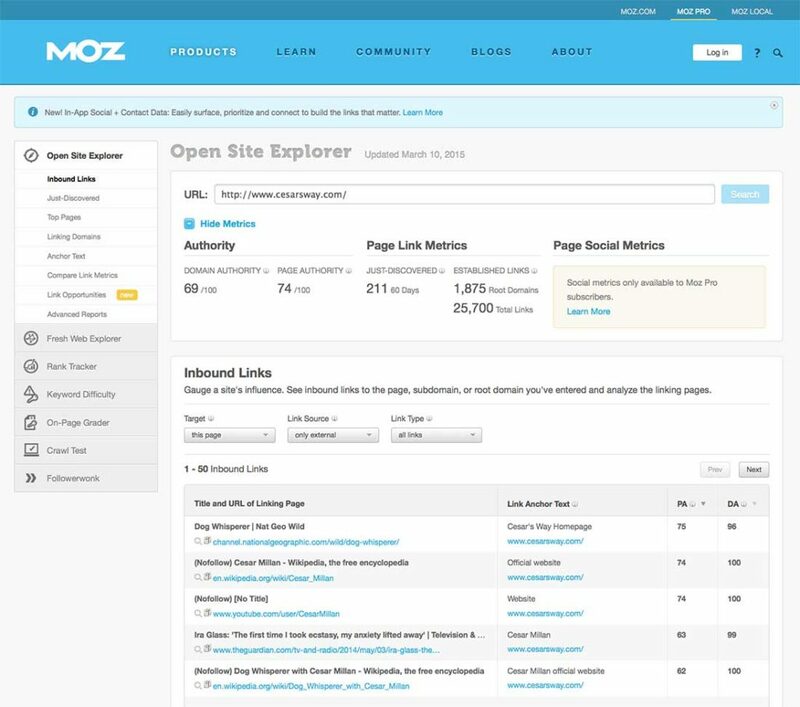 After you’ve got your Majestic SEO data, do all your searches again with the Moz Open Site Explorer. This is a good reality check, just in case Majestic, or any of the other tools you might use, give you wonky information. That’s a critical thing to remember with online tools: Don’t take what they tell you as gospel. Sometimes their data can be off. If you want a truckload of data, sign up for Moz’s free trial. Just don’t blame me if you get addicted to their paid tools. Other tools to see backlinks and more are Ahrefs, Link Prospector and Monitor Backlinks. There are more – that’s just the short list. SEMRush – This is an extremely powerful paid tool. Fortunately, it also has a powerful free version. The screenshot below is from the free version. 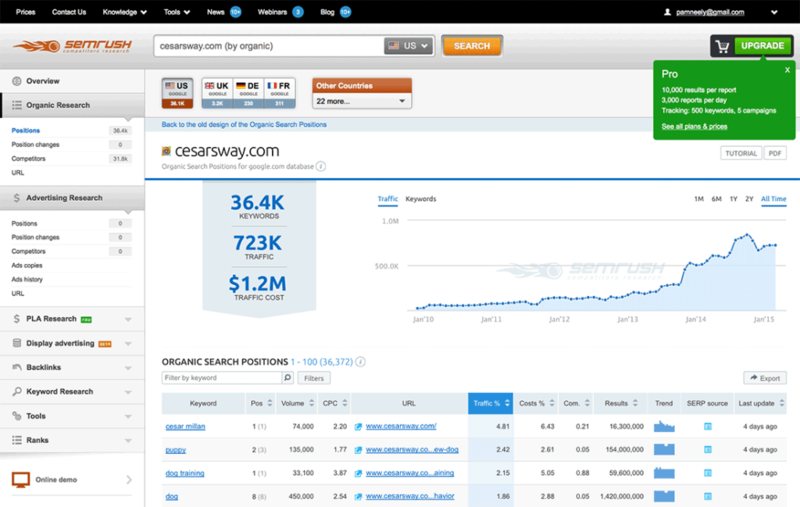 SEMRush will show you what keyword your competitors rank for in both organic and search. It will also show you what their traffic is worth, give you an analysis of their backlinks, and much more. Spyfu – SpyFu is like SEMRush and Moz in that it does dozens of things, all of them suited to peering into your competitors’ businesses. Fortunately, it does have a free version, and while that won’t go into too much detail, it will give you good information you’ll be glad to have. 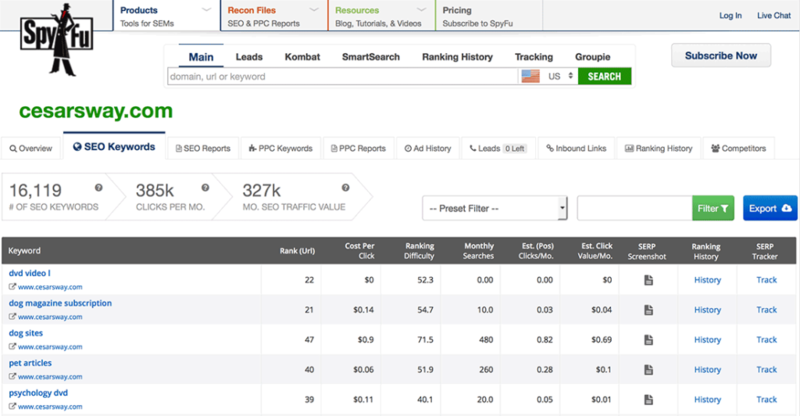 SpyFu is also great at breaking down a competitor’s pay per click accounts. If you’re in the ppc game fighting against other bidders, a few hours spent with this tool could save you hundreds, if not thousands of dollars. What Runs Where – I’m kind of cheating with this one. There isn’t a free trial – there’s a $1 trial. And you’ll want to make sure you cancel it before the three days are up, or you’ll get charged $299. But if you spend money on advertising, and your competitors do too, get a quick peek at what they’re doing by testing this tool. There may now be thousands of tools to monitor social activity, both your own and your competitors. These are just a few of my favorites, designed to give you the basic data you need, and no more. 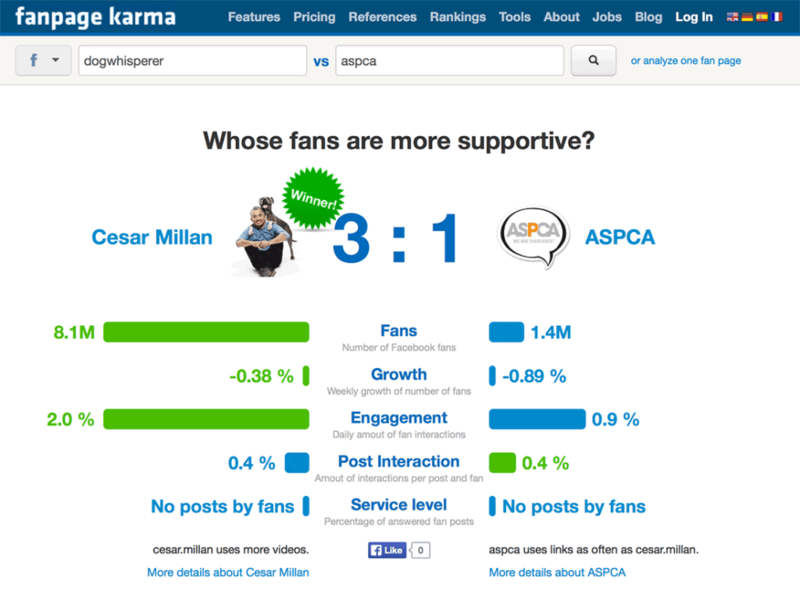 Fanpage Karma – So maybe your competitors do have more followers than you… but are those followers engaging with them? Fanpage Karma will tell you for free. 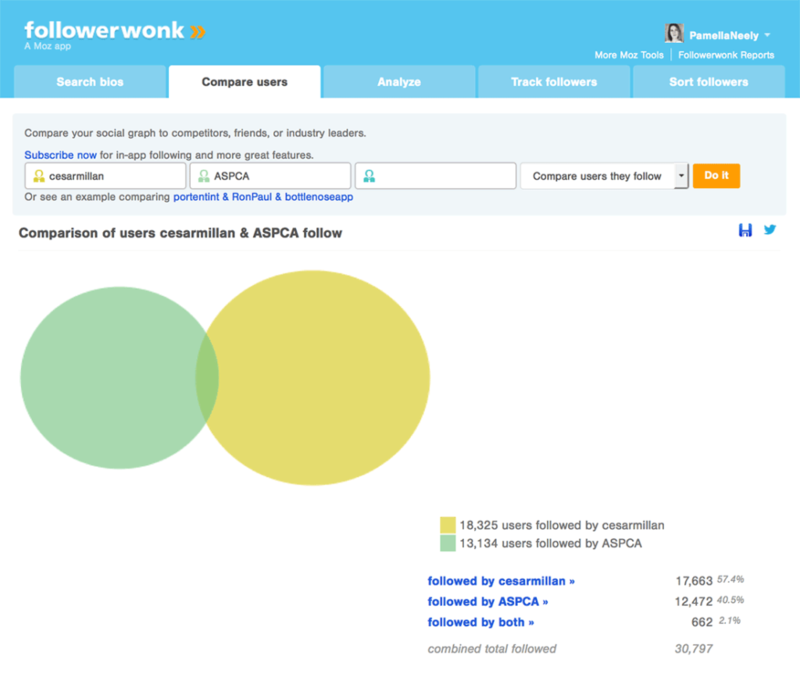 Topsy and FollowerWonk – Want to see how your competitors are doing on Twitter, and which tweets get the most engagement? Topsy and FollowerWonk are two of the best free tools for this. Simply Measured – This is an enterprise level tool that will give you lots of analytics data for your own company and other companies. It works across all the major social networks and most of the minor social networks, too. I’m including it here because of the free trial. 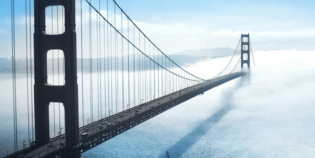 Compete – Most of Compete’s features are paid, but they have a free tool. It will give you a count of unique visitors for the month prior. Use that data as a reality check for other tools. Alexa – People have been using Alexa for over a decade to pick up information on other sites. There’s no reason for it to stop now, even though there are plenty of other tools that do what Alexa does. 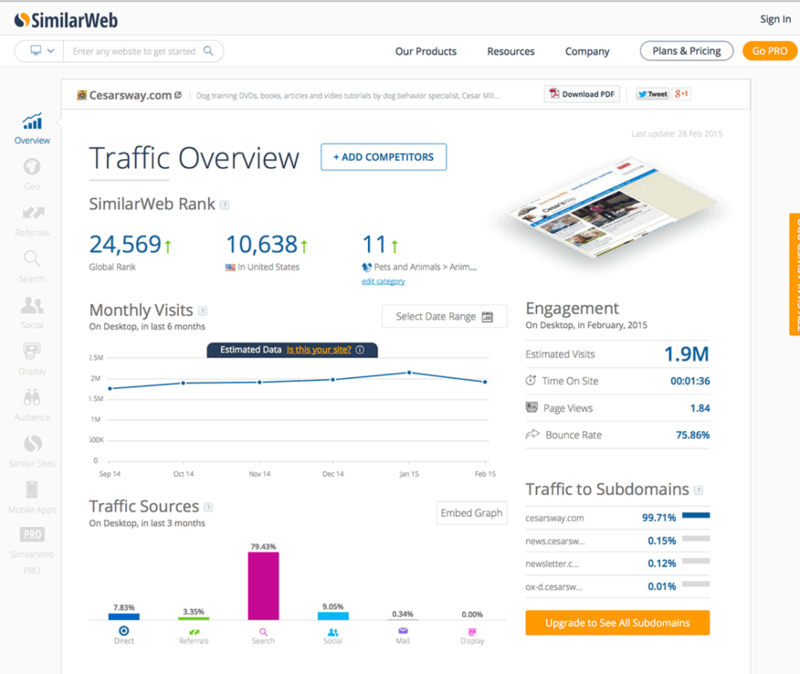 SimilarWeb – This is the only tool I’ve found that gives competitive information for apps. Mobile developers and marketers, celebrate! SimilarWeb will give you much more information for free, but my favorite feature is the handy little snapshot of where their traffic is coming from. SimilarWeb also gives you estimated time on site for each site, and their bounce rate. It lets you compare multiple sites, too. It’s tailor-made for competitive research. I’m sure I missed at least a few good competitive analysis tools. Do you have a favorite that’s not listed here? Tell us about it in the comments!